Τα δικηγορικά γραφεία «ΠΑΥΛΑΚΗΣ – ΜΟΣΧΟΣ & ΣΥΝΕΡΓΑΤΕΣ» κατέχουν εξέχουσα θέση διεθνώς στην επιδίωξη των απαιτήσεων θυμάτων αεροπορικών ατυχημάτων και των οικογενειών τους. Το γραφείο μας εκπροσωπεί αποκλειστικά και μόνον θύματα αεροπορικών τραγωδιών και τις οικογένειές τους στην επιδίωξη των δικαιωμάτων τους κατά των αερομεταφορέων, ασφαλιστών, κατασκευαστών, υπηρεσιών εναέριας κυκλοφορίας, κυβερνητικών και στρατιωτικών αρχών, καθώς και κατά παντός άλλου υπευθύνου φυσικού ή νομικού προσώπου υπεύθυνου για το εκάστοτε ατύχημα. Πολλές υποθέσεις που έχουμε χειρισθεί μας έχουν ανατεθεί από δικηγορικά γραφεία στην αλλοδαπή, λόγω της εξειδίκευσής μας. Η εξειδικευμένη στα αεροπορικά ατυχήματα ομάδα του γραφείου μας αποτελείται από δικηγόρους με σπουδές στο αεροπορικό δίκαιο, αναγνωρισμένους στον τομέα των διεθνών αεροπορικών ατυχημάτων, με συμμετοχή μόνιμου συνεργάτη μας (in-house) διερευνητή αεροπορικών ατυχημάτων με διεθνή πιστοποίηση και αναγνώριση και συνεργασία τεχνικών συμβούλων και διερευνητών με εκτεταμένη διεθνή εμπειρία σε τέτοια συμβάντα. Μόλις μας ανατεθεί μια υπόθεση, προβαίνουμε κατά το δυνατόν στην διενέργεια δικής μας τεχνικής διερεύνησης του συμβάντος. On November 17, 2013 a Boeing 737-53A operated by Tatarstan Airlines crashed in Kazan, Russia while trying to land killing all 50 passengers and crew aboard. Our firm represents the families of 17 deceased passengers and crewmembers in actions against both manufacturers BOEING, owners and lessors AWAS and operator Tatarstan Airlines. During a post-maintenance test flight military helicopter AH-DHA (Apache) ES 1030 crashed on July 30, 2010 in the vicinity of the Megara military airport near Athens killing both pilots. Our firm represents both families and we are executing an extensive investigation on behalf of our clients. Trial is pending. A 17 year old student was killed during his first flight lesson when the ultra-light private aircraft of his instructor crashed on June 29, 2010 in Aegion, North Peloponnese, killing both of them. Our firm represented the parents of the unlucky boy in an action against the flight school. A 31 year old student was killed during a recreational flight with his instructor on May 2009 in Kopaida near Athens when shortly after take-off of a FAETA-321, the aircraft took a right roll and spiraled to the ground killing both persons aboard. Our firm represents the family of the 31 year old passenger in trials. On September 14, 2008 a Boeing 737-505 operated by Aeroflot-Nord crashed in Perm, Russia while trying to land killing all 88 passengers and crew aboard. Our firm represented the families of 11 deceased passengers and crewmembers in actions against both manufacturers BOEING and operator Aeroflot-Nord. On May 3, 2006 a passenger AIRBUS A320 operated by Armavia Airlines of Armenia crashed in Sochi, Russia while trying to land killing all 103 passengers and crew aboard. Our firm represented the families of 75 deceased passengers and crewmembers in actions against both manufacturers AIRBUS SAS and operator Armavia Airlines (read full case analysis). On February 20, 2006 a military helicopter UH-1H ES 622 of the Greek Army crashed during a night training operation when due to bad visibility the helicopter crashed on mountain terrain. Out of the three officers killed our firm represented the families of two in legal action against the Greek State and Hellenic Army claiming poor planning of the training operation and lack of safety oversight in relation to night training flights. Following a long and difficult trial which involved extended highly technical piloting and military training issues, the Thessaloniki Administrative Court of Appeal found the Greek State liable for the accident and awarded significant sums for moral damages to the families of the two pilots. On August 14, 2005 a Cypriot airliner Boeing 737-300 operated by Helios Airways crashed north of Athens airport in one of the most tragic accidents of the world aviation killing all 121 persons onboard. As it was found during the investigation both pilots suffered hypoxia intoxication when they failed to detect that the aircraft climbed without cabin pressurization. The aircraft on the AUTOPILOT continued to its destination and crashed near Athens when its fuel was exhausted. Our firm represented the families of 20 passengers in actions against manufacturers and operators. On September 11, 2004 the military helicopter CH-47D (Chinook) of the Greek Army while on a civil transportation mission crashed into the sea before reaching its destination at Athos Mountain in Northern Greece. All 17 persons aboard perished in the crash among them the Patriarch of Alexandria. Our firm represented the families of 11 victims including all 5 crewmembers. In August 2003 a fire fighting PZL M-18 crashed while his sole occupant, an officer of the Greek Air Force fought a wild-fire in Lesvos island in Northern Greece. Our firm represented the family of the killed pilot. In the third of its kind within 20 months, HEMS medical helicopter Agusta-Westland A 109E Power, crashed while flying near Ikaria island. Our firm represented the family of the paramedic who was killed in the crash. On June 17, 2002 after taking a patient from Anafi island in the Cyclades, HEMS Agusta-Westland A109E Power helicopter operated by Italian operator Helitalia SpA crashed on a mountain of the island shortly after take-off. Our firm represented all 5 persons aboard including the two pilots. On May 28, 2001 a military helicopter UH-1H ES 6643 of the Greek Army during a night training operation ditched in the sea following an engine failure. Our firm represented the family of the heroic pilot who managed to save the life of the other two persons aboard but tragically lost his life during the ditching operation. On January 14, 2001, 7 miles south of Sounion near Athens a HEMS Agusta-Westland A109E Power helicopter operated by Italian operator Helitalia SpA crashed in the sea during severe thunderstorm. Our firm represented the families of the medical doctor and the co-pilot who were killed during the crash. 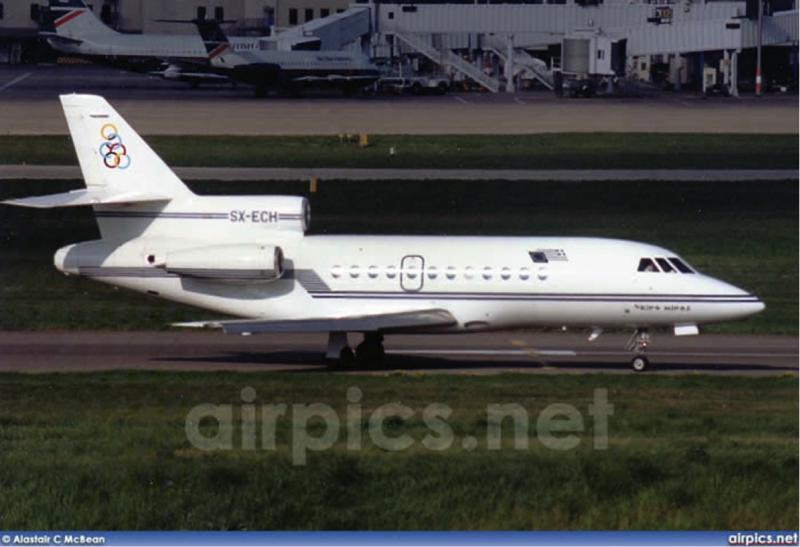 On September 14, 1999 at 18:16 UTC the FALCON-MYSTERE 900B aircraft of the Greek Government, operated by Olympic Airways took-off from Athens international airport for a diplomatic government trip to Bucharest, Romania coded OA 3838. Aboard the aircraft were the Greek Deputy Secretary of State, Mr Giannos Kranidiotis, his 18 year old son, Greek diplomats, journalists a flight engineer and 3 crewmembers, the two pilots and one flight attendant. The flight proceeded uneventful for more than one hour, after which the aircraft started its descent for landing. While on the descending phase and between FL 150 and FL 140 the aircraft for 24 seconds experienced 10 oscillations in the pitch axis which exceeded the limit maneuvering load facts. The impact of the unfasten passengers with cabin ceiling and aircraft furniture, due to acceleration occurring during the pitch oscillations caused fatal injuries to 7 passengers including the Deputy Minister and his son, serious injuries to 1 crew member and 1 passenger and minor injuries to 2 passengers. We represented the family of the deceased flight engineer. The accident investigation report issued according to Annex 13 to the Chicago Convention by the Romanian Civil Aviation Authority highlighted serious pilot errors which undisputedly contributed to the fatal injury of the deceased. Nevertheless we initiated action against both Olympic Airways and French manufacturer of the aircraft DASSAULT AVIATION S.A. The case was settled before trial for a confidential sum. Nevertheless, despite the settlement which terminated the civil case on favourable terms for our clients, our firm continued to represent the family of the deceased engineer throughout multiple criminal trials before Greek Courts.